Editor's Comments: Bill and Margo joined Oklahoma Region and campaigned an Austin Healey Bugeye Sprite. They prepared the Sprite into a Concours winner. I can't remember or find what their second or third "projects" were, but fourth was their truly championship caliber 1934 Packard Coupe. Margo wrote this story for the July, 1967 Gazette. 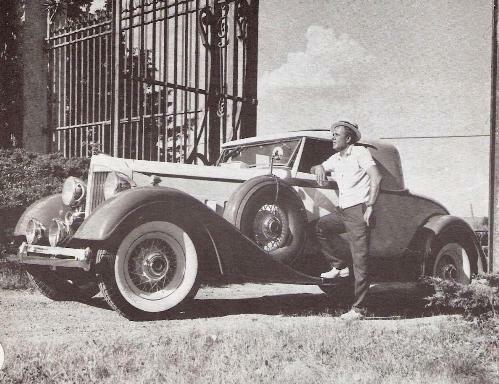 The photo of Bill with the Packard was taken at the gate of the old Cravens Estate on May Avenue, North of 150th. The gate is gone, but a few of the cedar trees that lined the West side of May for nearly a mile are still standing. July ‘7, 8 & 9 marked the Annual National Grand Classic at the spacious new Hilton Inn in Dallas, Tex. Have you ever driven 200 miles at a roaring 45 mph? Wow! Nevertheless, we did arrive in Dallas before nightfall and the entire Meyer family pitched in with “spit & polish” to put the final touches on the car we had eaten with, slept with and dreamed of for 5 & 1/2 months. Would you believe painting the entire car, including the tires, with a water color brush the night before the show? It can be done! At noon the following day the time for judging finally rolled round - and believe me our stomachs were “rolling around” too. Would our nightmare come true? Would the car refuse to start when the Judge said, Start your engine?” Key on - push the starter button - IT STARTED!! Please, horn - Honk! Windshield Wipers - “perform.” One goes like mad - the other - Dead! Well, so goes it –off come a couple of points. The perspiration is pouring off the entire family - woops - we must stop that or the judges will think the car is leaking! Now the long wait until the Awards Banquet to find out how we did. Well, it happened - the very first 100 point car the Southwest Region has ever had and guess whose class it was in - Ours! So we came in with a Second Place Trophy and felt very proud. The rest of the cars were magnificent. Rolls Royces, Packards, Lincons, Mercedes Benzes, Duesenbergs, Cords, a 1934 Aston Martin that raced at LeMans and many other unusual classics were displayed, all beautifully restored with each owner proudly standing guard with a ready smile and answer to each question. The next morning found us on our way back to good old Oklahoma City and we arrived home tired, hot, but very happy. Bill says this is the last one he will restore - but I wouldn’t bet on it. Four restorations in three years - oh well, I just love to eat, sleep, think and “spend on” cars - sports cars, classic cars, race cars, cars, cars, cars !! !